Bhangra: The dance known as Bhangra is one of Punjab's most popular dances and the name of the music style. Bhangra is done with classic style Punjabi dresses, and with instruments including a Dhol, Chimta, Tabla, etc. It was originally danced during the harvest season, but now is a popular form of celebration at any time such as weddings and festivals. Bhangra is a very popular style of music and dance in Punjab, but is also very popular in the diaspora, specifically in Canada and the U.K. where many Bhangra competitions are now held. 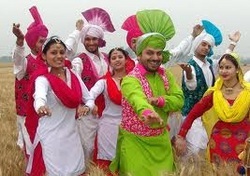 Creating Bhangra teams has become very popular and influential with teenagers.